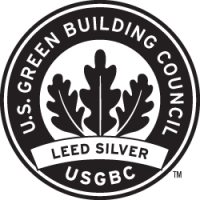 We are the first convention center in Tennessee to be certified LEED Silver for Existing Buildings from the USGBC and Green Certified through the TN Green Hospitality Certification program. 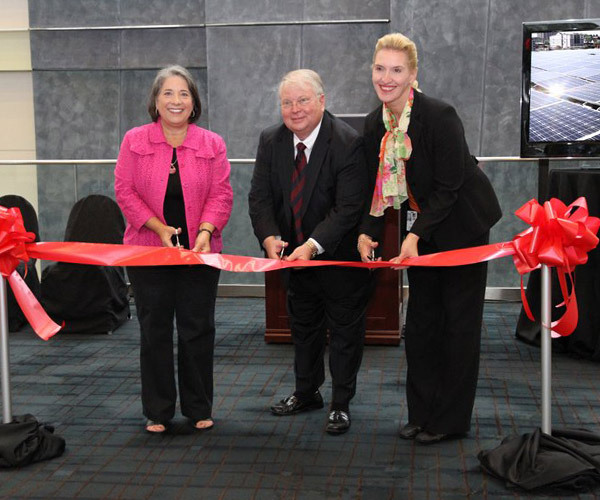 Knoxville Mayor Madeline Rogero, Tim Butler, the technical project officer from DOE’s Office of Energy Efficiency and Renewable Energy, and Mary Bogert, general manager of the Convention Center, officially celebrate the completion of the solar array at the center. That is important to the Knoxville Convention Center because we work here and invite our guests into our “home.” We believe Knoxville’s natural beauty is a huge attraction for our area, and we are committed to protecting the natural resources of this community for our visitors and residents. The TN Green Hospitality Program is an official part of the Tennessee Hospitality Association, and we also earned its designation, which seeks to promote a sustainable state. We established a Green Team of staff members working in concert with our vendors to monitor and implement “green” practices to keep the staff, community and guests aware of the environmental support we give and live. The Convention Center is committed to being a facility that takes the environmental impact of its use seriously, and our sustainable practices are intricately woven into our everyday operations. The facility operates a single-stream recycling program, which allows all recycled materials to be put in the same container for greater efficiency and less waste. Recycled materials include paper, cardboard, aluminum, steel, glass, plastic and mixed paper products. The Knoxville Convention Center annually recycles approximately 16 tons of food and materials. All stationery, brochures and business cards are printed on recycled paper. All restroom paper products meet EPA standards for post-consumer wastepaper content and are biodegradable. Toilet tissue is free of a cardboard insert, and automated biodegradable foam soap dispensers are installed in restrooms. Shredded paper products are recycled as packing material. With a limited number of items that cannot be recycled, including cleaning products, restroom paper products and disposable plates, cups and cutlery contaminated with food, the Knoxville Convention Center uses biodegradable items that are more readily broken down to help protect the environment. Energy retrofits provide the center with $165,000 in cost savings each year. The largest city-owned solar photovoltaic system, consisting of more than 450 panels installed on the roof, provides more than 120 kilowatts of power. A 30-ton, air-cooled chiller efficiently cools the center. High-pressure boiler with energy-efficient pulse boilers allows decreased use once desired temperature is reached. This change decreased natural gas costs by 50 percent. Abundant natural lighting in the concourses reduces need for facility lighting. Motion-sensitive light switches in high-traffic restrooms and break rooms automatically turn off during inactivity. Lighting in some areas has been replaced with smart bulbs. Technician-controlled lighting system allows levels to be at 50 percent during event move-in/move-out and 100 percent only during event hours in occupied spaces. Window tinting along the west side of the building and on skylights lowers the temperature of public concourses. Domestic hot water supply allows “high pressure” boiler to be turned off when not needed, lowering energy consumption. Carbon dioxide (CO2) monitors are installed throughout center. Perennials need less water than annuals so we reduced consumption by changing plants. Live trees inside the center help clean the air and support the oxygen/carbon dioxide exchange. The facility donates unserved food from its catering department to the local food bank, totaling about four tons annually, and is the largest donor of prepared food in Knox County. The in-house food and beverage department, SAVOR, uses primarily local products purchased within 90 miles of the facility. As part of the Convention Center’s farm-to-table program, some herbs and produce used in the center’s catering department are grown onsite in functional landscaping around the property and in a grow room in the facility. Re-useable food and beverage containers are a priority for the kitchen and returned to purveyors. Cooking oil is recycled for use in the creation of other products. Cleaning products are biodegradable and less toxic to the environment. Employees have been trained in “green cleaning” techniques and product use. We use green chemicals, dispensers that distribute proper concentration and microfiber cleaning cloths and mops, which eliminate spread of germs and bacteria. A “Plumb-It” system helps kitchen drain lines stay clean and reduces grease in trap.